Finding healthy and wholesome CBD pet treats can be challenging. With so many choices and varying degrees of quality, you need a brand you can trust. Enter Treatibles. This California-based company puts care and compassion front and center, providing safe and tasty treats for your four-legged friend. With bases in both the US and the UK, Treatibles leads the way when it comes to CBD for pets. It was the first company to create phytocannabinoid-infused products for pets, and it maintains a mission to promote and deliver harmony for the whole family (furry friends included). The Treatibles products help soothe and calm beloved animals of all shapes and sizes, bringing balance and relief to a number of different situations. Using only the most natural and wholesome plant-based ingredients while embracing the values of compassionate care, consistency, and careful third-party lab testing, you can feel confident that you’re giving your pet the very best when you see the Treatibles logo. Why Choose Treatibles CBD Dog Products? As a responsible and diligent dog owner, chances are you pay more attention to your pet’s diet than you do your own. And who can blame you? Dog foods and treats can be a dice roll, with question marks over ingredients, preservatives, and production methods. What’s more, if your beloved furry friend suffers from stress, illness, or physical issues, it can make finding a nourishing and wholesome treat even more difficult. That’s why Treatibles CBD Dog Treats stand apart. They’re chock-full of goodness, containing CBD, turmeric, hemp seed oil, essential fatty acids, and lots of beneficial nutrients. Handmade and lab-tested in sunny California, these treats are grain-free, preservative-free, and non-GMO. 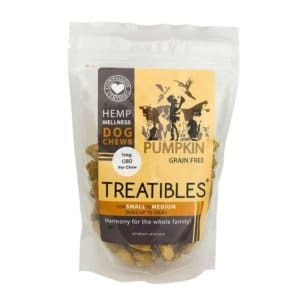 Treatibles CBD Dog Treats are pumpkin-flavored and available in small or large sizes. You might be wondering why you should buy your next Treatibles CBD dog chew online. Well, the answer’s simple: we’ve spent a great deal of time curating our web shop to make sure we offer only the very best quality and selection of CBD products available. And we’ve worked hard to deliver a simple and straightforward ordering process, from start to finish. It couldn’t be easier. Browse and buy from anywhere, at any time, with Healthy Hemp Oil. Remember: If your pet is pregnant, lactating, or suffering from a serious illness, ask your veterinarian before giving your dog any new supplements, applying topical oils or ointments, or changing its diet in any significant way. Also, remember to keep your CBD products in a dry and cool place, out of the reach of children and pets. The Healthy Hemp Oil mission is to become the most consumer-focused provider of CBD pet products available online. And with a commitment to researching and sharing the latest objective information (including recent scientific studies) regarding CBD, we’re well on our way to achieving that. Our unwavering attention to detail extends to our careful selection of CBD dog treats, such as the Treatibles range of dog chews. It’s vitally important to us that you feel happy in your next CBD purchase, so if you’re ever unsure about anything related to CBD, our friendly support staff are only ever a click away. Check out the Treatibles CBD dog chews for sale, or get in touch if you have any questions.